Shane Long has not scored since February. The contrast between Shane Long and Mohamed Salah was apt on Saturday afternoon. The Ireland striker is now 31 games for club and country without a goal, with the Egyptian nudging in his 13th and 14th goals in his 18th appearance for Liverpool so far this season. Long has enjoyed a miserable spell in 2017 following a previous year in which he was a major factor in leading Ireland to the European Championships plus Southampton to the final of the League Cup. In fact, it was against Saturday’s opponents that Long recorded one of his few personal highlights of this calendar year — scoring a late, great winner to dump Klopp’s side out of the EFL Cup at Anfield. 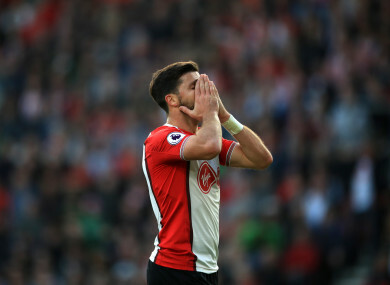 Despite Liverpool failing to beat the Saints in their last five attempts, it was not a happy hunting ground for the visitors this time around, nor was it for Long. He played his usual game of intense sprinting, chasing loose balls, pressing and running across the opponent’s backline. But he failed to seriously test Simon Mignolet once. Rather Long had to watch on in envy as Salah slotted in a comfortable brace, making scoring in the Premier League look like the easiest and most natural thing in the world. The Ireland striker will be looking to make a clean slate in 2018 and will be counting down the days to the New Year. Unfortunately for him the year will not include playing at a first ever World Cup, while Salah will be the leading figure for Egypt in Russia. Two players at the opposite ends of the spectrum; one scoring for fun, the other suffering in the midst of a drought which continues with each passing week, performing below the standards of a player who knows he is better than his recent stats prove. The conversation goes that if Liverpool had a reasonably okay defence, then not only would they be toasting Champions League football and a top four place, but they could potentially push even further around the skirmishes of third and second place. Following their 3-0 defeat of Southampton on Saturday evening you couldn’t help but ponder the point. In attack Jurgen Klopp’s side were simply brilliant, with the Saints performing like a feeble kitten pawing helplessly at a piece of string. It was pedestrian for the Reds and it sometimes even seemed that they were wasteful in front of goal. They managed to beat Fraser Forster three times, but with 21 shots on his goalmouth throughout the afternoon it could and probably should have been more. Part of the reason the England goalkeeper was so busy was in no small part due to a below-bar performance from one Virgil van Dijk. The cameras loomed on the Dutch defender in the build-up to kick-off following his summer transfer debacle to Anfield which never materialised. It seemed van Dijk would do anything to force the move through, but Saturday’s poor display will not have impressed manager Klopp. The Liverpool boss will be keen to fix his side’s poor defensive record ASAP as a matter of immediate urgency, and may have seen van Dijk as a solution as soon as January. Shipping three goals in front of the Reds faithful and with the German watching on from the sidelines, his move to Merseyside may have gotten that bit more complicated as he failed to impress when he was in the spotlight. He’s the man who can do a job. It won’t be pretty, it won’t bring you goals, but it will keep you steady in the top tier bringing in that valuable Premier League television money year, after year. Where Tony Pulis had once revelled in that philosophy of assured stability, now he is on the brink of his first ever sacking as a Premier League manager after scuppering to a dismal 4-0 defeat to champions Chelsea at the Hawthorns on Saturday afternoon. His West Brom side have won just two of their last 21 Premier League outings, leaving them on the brink of the relegation zone. Chants of “you’re getting sacked in the morning” were heard as goals from Alvaro Morata, Marcos Alonso and a brace from Eden Hazard saw Antonio Conte’s side pummel West Brom in front of their own supporters. Supporters who seem to have lost patience with Pulis after less than two years in charge. The patented defensive organisation and rigid structure which had been a hallmark of all Pulis sides had gone missing as goal after goal poured in, and fans left with half an hour to go. This season marked the 10th in succession which the Welsh manager had taken charge in the Premier League. He often seemed unsackable, however his hold on his current position at the dugout at the Hawthorns now seems untenable. Paul Pogba showed Manchester United what they had been missing with a man-of-the-match display as the Red Devils overpowered Newcastle at Old Trafford today. The 24-year-old France international provided a deft cross for United’s opening goal, before blasting home a simple finish for the third from Marcus Rashford’s intelligent knockdown. Unsurprisingly, Jose Mourinho was glowing in his praise for Pogba afterwards. “Paul Pogba is different class,” the United boss told BT Sport. According to Opta, Pogba now has four goals and four assists in his last six Premier League appearances. Moreover, it is no coincidence that his two-month layoff coincided with United dropping points against Chelsea, Huddersfield and Liverpool. He was badly missed. Is it time for Tottenham to try a different approach against the big sides? While there is a case to be made that both Arsenal’s goals should have been disallowed as they were arguably offside, the Gunners’ 2-0 triumph was a fair reflection of their superiority on the day. Whereas Alexandre Lacazette, Alexis Sanchez and man of the match Mesut Ozil all contributed significantly to the victory, Tottenham’s front three delivered subdued displays, with both Harry Kane and Dele Alli taken off 15 minutes from time. Their loss today means Spurs have just one win on the road in 17 matches under Mauricio Pochettino against Liverpool, Chelsea, Arsenal and both Manchester clubs. Tottenham have been renowned for their style under the Argentine coach, which is invariably attractive to watch. However, at times against the big sides, they look far too open. Today was no exception with Mousa Dembélé and Moussa Sissoko second best in midfield more often than not. The absence through injury of their primary midfield destroyer Victor Wanyama was undoubtedly a disadvantage, but even with the former Celtic star in the side, their record against the top teams has been poor. In future, Pochettino surely needs to adjust his team’s approach — otherwise the club’s 56-year wait for a league title will likely continue for the foreseeable future. Email “Spurs' record against the top six, Shane Long's goal drought and more Premier League talking points”. Feedback on “Spurs' record against the top six, Shane Long's goal drought and more Premier League talking points”.